Johannesburg - South Africa midfielder Thulani Serero says only a place in the 2013 Africa Cup of Nations final will be good enough for the country. According to the football411.com website, the continental showpiece will take place on home soil and much will be expected of the hosts. 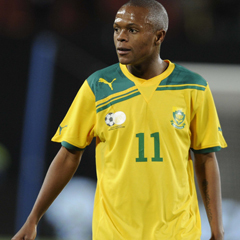 Serero, whose participation in the tournament remains in doubt as he is still recovering from a troublesome groin injury, believes Bafana Bafana can and must live up to the billing. "We have to reach the final at least to make the country proud," the Ajax attacker told BBC Sport. "As we are playing at home, there is a very good chance of us winning the Africa Cup of Nations." Gordon Igesund's side are placed in Group A along with Morocco and Angola, and Serero feels that no team can be taken lightly in the showpiece event. "There are no dark horses in the tournament. Everyone did well to qualify and anyone could win it," he said. "We have good players and a good coach and I think the players are hyped up to show the country what they can do. "The pressure on the team is very big but the players and the coaches all know what is expected and surely we will deliver. "It's not like the team has been playing bad, we were just not scoring goals. Hopefully that will change in the tournament. If we do well, everybody will be happy." Meanwhile, the 23-year-old is of the opinion that Benni McCarthy could be a useful addition to the squad. "I think if Benni McCarthy came back into the squad he could help," said Serero. "If he was there it would give players a boost, he can score goals. He is a very good player and I think he can still deliver."